Aaron Resnick, leading attorney in Miami, is the newest member of the elite Haute Living Haute Lawyer Network. Aaron Resnick, leading attorney in Miami, is the newest member of the elite Haute Living Haute Lawyer Network. An exclusive invitation-only professional network, only the most venerated attorneys make up this successful and sophisticated circle. Resnick was handpicked for his exceptional skill in Business and Commercial Litigation as well as Sports and Entertainment Law. A JD graduate of the University of Florida, he has established himself through years of success in the Florida community paired with multiple professional and bar association memberships, including that of the United States Supreme Court. Haute Living Magazine will feature Resnick as an exclusive Haute Lawyer. The exclusive Haute Lawyer network serves as every reader’s exclusive connection to the most established and venerated attorneys across the United States. A constantly growing professional network, members join on an invitation-only basis to ensure only the best are represented on the site. Haute Lawyer is also a buzzing source for legal news; the blog aims to educate readers on current events from the most newsworthy corporate showdowns to celebrity suits. Experts in the field pen their own posts on the latest updates, high-profile cases and exclusive information, bringing value and inimitability to the page. Stay in the know with http://www.hautelawyer.com. Aaron Resnick received his Bachelor of Arts in Political Science with honors from Emory University and a Juris Doctor with honors from the University of Florida. He perfected his legal craft at one of Florida’s most prestigious firms, Gunster Yoakley, prior to starting his private law firm in 2005. 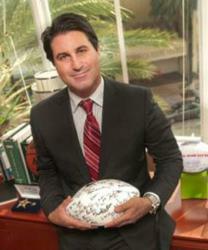 Resnick’s law practice focuses on business and commercial matters, along with sports and entertainment law. His firm now has offices in Miami, Boca Raton, Gainesville/Ocala, Jacksonville and New York City. Aside from his firm, Resnick runs a company that specializes in working with lenders on distressed assets. His practice includes the personal representation of both current and former professional athletes in the National Football League, the National Basketball League and Major League Baseball, as well as members of the arts, fashion and entertainment worlds.